During December 2007–January 2008, a limited trial excavation was conducted at the Ha-Gosherim site (Permit No. A-5323; map ref. NIG 2585/7923; OIG 2085/2923), prior to the installation of an electric pole. The excavation, on behalf of the Israel Antiquities Authority, was directed by N. Getzov, with the assistance of A. Grishna (field registration), Y. Ya‘aqobi (administration), A. Shapiro (GPS), E. Bron (preliminary inspections), Y. Nagar (physical anthropology), D. Syon (numismatics) and M. Hartal (guidance). 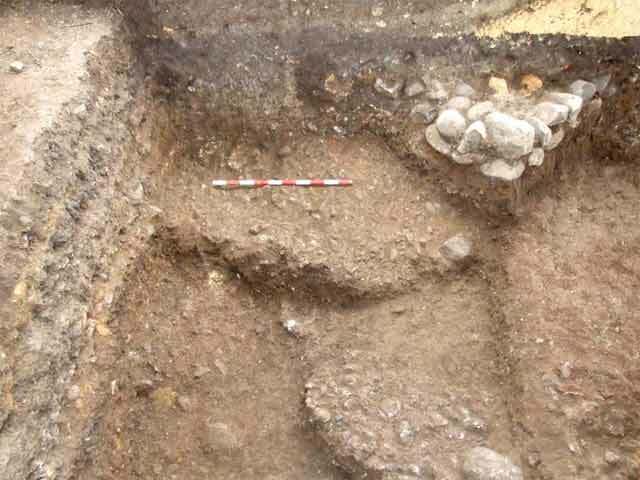 Previous excavations at the site had revealed habitation strata that ranged in date from the Pre-Pottery Neolithic C until the end of the Early Chalcolithic periods (HA-ESI 110:2*–3*; HA-ESI 118). The current excavation was carried out along the fringes of the site, at the top of a slope east of Nahal Koren. Evidence of habitation, present throughout all six strata that had been discovered in previous seasons, was exposed in the opened rectangular area (c. 4 × 8 m). Stratum VI (Pre-Pottery Neolithic C period). Evidence of this period was only found in a very limited area. Three superposed floors of small stones were discerned (Fig. 1). Since virgin soil was not clearly exposed, it could not be determined with certainty that no earlier remains had existed in this area. 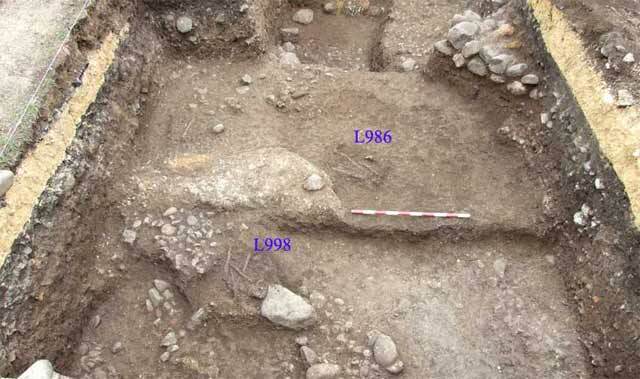 The three habitation levels, one above the other, reinforce the supposition that the Pre-Pottery Neolithic settlement at the site extended over a prolonged period of time. Noteworthy finds from this stratum were deep and densely denticulated sickle blades, obsidian bladelets and arrowheads (Fig. 2). Stratum V (Pottery Neolithic period). Two floors were discerned; below the bottom one, two individuals were buried in a flexed position (Loci 986, 998; Fig. 3). 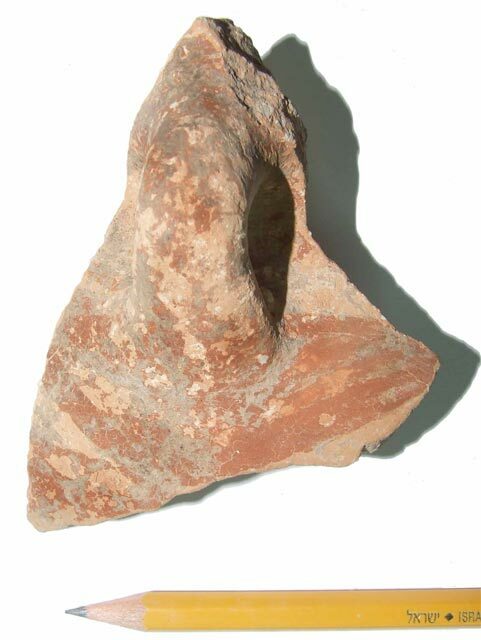 Numerous fragments of pottery vessels were discovered, including an amphoriskos that attested to ties with the Lodite culture (Fig. 4). Stratum IV (beginning of the Early Chalcolithic period). The corner of a building, abutted on the outside by a floor, was exposed. Most of the building was beyond the limits of the excavation and the finds from this period were meager. Stratum III (Early Chalcolithic period). Only a small number of potsherds could be ascribed to this layer. Stratum II (end of the Early Chalcolithic period). A rich accumulation, containing potsherds and stone tools, but no architectural remains, was discovered. The importance of the finds from this period is considerable, since only a few artifacts from this period had been found in previous excavations. Stratum I. A Roman coin from the middle of the fourth century CE was found on surface. A vertical accumulation of assemblages from all the known strata at the site is unique to this area; assemblages of only a few strata were found in most other areas. 1. Stratum VI, floors and a wall from Stratum IV, looking northwest. 2. 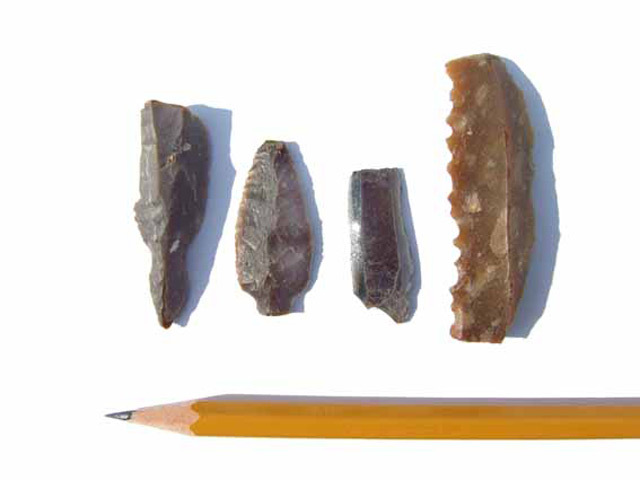 Stratum VI, artifacts, from right: a sickle blade, obsidian bladelet and arrowheads. 3. Stratum V, chalk floor and two burials beneath it, looking southwest.